Lounging in a luxurious, small boutique hotel room with the amber light of the bedside lamp, the panoramic window cracked to let in the fresh cool air. Outside several wisps of cloud cling to the mountainside, just after the rain. Dusk settles in, only a faint yellow fading on the horizon. 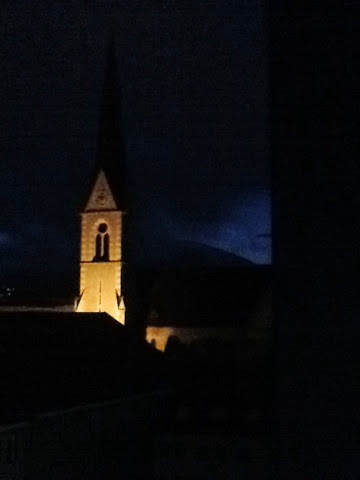 The bell tower of St. Nikolai rises dramatically against the mountain backdrop, lighted subtly from below. Lights twinkle in the distant foothills. Thus begins our first, and long overdue, weekend summer getaway. We have come to Villach, near the Austrian Italian border; home of mountains, lakes, and the river Drau, on whose banks our modern retreat comfortably resides. Beneath me the lights of the town begin to glimmer, as more low clouds sweep across the mountain view. The night air smells fresh, with hints of pine and clean glacial lakes. The day's moody rain clouds solemnly roll eastward, and the bell chimes from its tower. It is an early evening in for me, while Jon is downstairs enjoying the sauna. We strolled through the rain in late afternoon, crossing a nearby bridge to the city center. Our investigations paid off, as one of the historic buildings off the main square boasts a sidewalk cafe with a very affordable traditional breakfast - we plan on trying it in the morning. Afterwards we will make our way to Tarvisio, Italy, just 30 minutes away. It will be Jon's first trip to Italy, and we hope to buy some authentic parmigiana for an afternoon picnic while hiking in the Carinthian mountains. Tonight I had what I presume to be rather classic Southern Austrian fare, pasta dumplings stuffed with herbed tropfen in butter sauce with a side of green salad. Tomorrow promises Italian food, naturally, and if I'm very lucky, perhaps an Italian leather handbag from the open air market?